In Scotland, it is currently common to use the terms transgender people or trans people as an ‘umbrella’ to cover the many diverse ways in which people can find their personal experience of their gender differs from the assumptions and expectations of the society they live in. As transgender people have become more widely known and written about, various terms have developed in an attempt to highlight similarities and differences. However, individual people will still always view themselves, and experience their lives, in unique ways. This section of the website provides a general idea of what are currently the most common definitions in use in Scotland. The terms used in other parts of the world are often very different. The definitions given in this website are not exhaustive and certainly not infallible. Please also remember that the terminology is still evolving so definitions may change in the future. While the Scottish Transgender Alliance shows various more specific terms under the ‘transgender’ or ‘trans’ umbrella, this does NOT mean that we think ALL people who identify with one of these more specific terms will also see themselves as being transgender or trans. Although the Scottish Transgender Alliance, which is part of the Equality Network, has a small number of intersex people within its membership and active volunteer base, we recognise that intersex status is distinct from trans status and that intersex people experience some very specific human rights violations. Intersex people may identify as men, as women or as non-binary. 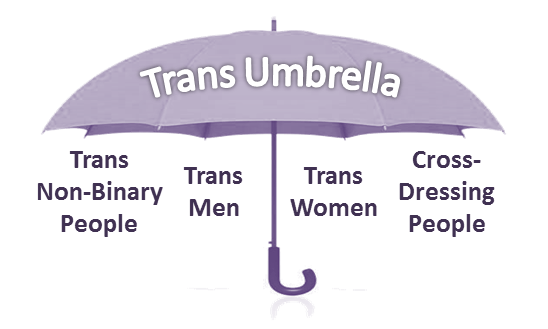 The intersex umbrella is separate from the trans umbrella. At the end of 2014, the hard work of Scottish intersex activists and the Equality Network succeeded in getting the Scottish Government to move from a framework of lesbian, gay, bisexual and transgender (LGBT) equality work where intersex was problematically included under transgender, to a framework of lesbian, gay, bisexual, transgender and intersex (LGBTI) equality work where intersex is regarded as distinct from transgender. We are committed to working in alliance with intersex activists and organisations. The first step in making that commitment a reality will be for the Equality Network to engage in discussions with as many intersex people as possible across Scotland, and the Equality Network will be prioritising that in the rest of 2015 and early 2016. As with all the Equality Network’s work, it will then base its future priorities for intersex equality work on what intersex people say is important and needs to change, and what the Equality Network’s part should be in that change, and the Equality Network will prioritise intersex equality work alongside its ongoing LGBT equality work.